In the Palestinian village of Duma in the West Bank, the interior walls of the one-floor home were blackened and still radiated heat as Israeli police surveyed the scene on Friday morning. A brown couch was covered in white ash as charred debris lay strewn around the property. A second house nearby, which was empty, was also set on fire. Inside the torched home, relatives scraped through the ash and soot to salvage any belongings. 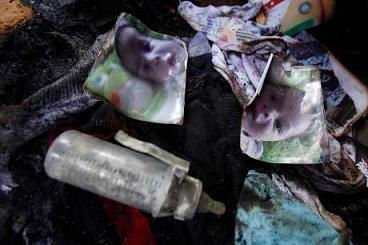 They found a partly burned picture of the slain child and his bottle, (Pictured) still one-third full of milk. Mohammed Ibrahim Dawabsheh, a neighbor, said he saw the mother running out of the house on fire and then covered her with a sheet to try to extinguish her flaming body. His son, Ibrahim, said he saw two masked men flee the scene. Another neighbor, Mohammed Dawabsheh, said he tried to push into the blaze to save the child but the flames were too strong.